(Bloomberg) -- Indian billionaire Anil Ambani has spent years fending off creditors and suing critics of his debt-saddled business empire. But his moment of reckoning may have arrived, as he races to pay debts or face a possible jail sentence. On Feb. 20, India’s Supreme Court said that the Reliance Group’s phone unit had disobeyed a ruling to pay about $77 million owed to the local subsidiary of supplier Ericsson AB, adding that the tycoon will personally face three months of jail unless the payments are made within four weeks. Ambani’s group said it will comply with the order and make the payments within the required time. It’s an extraordinary fall for a man listed by Forbes magazine in 2008 as the world’s sixth-wealthiest person. The court’s decision comes after a tough year for Ambani, as parts of his empire saw losses and competition in India’s telecommunications market became increasingly brutal. His story also offers insights into how far India has come in cracking down on overdue borrowers and curbing the financial impunity of its richest citizens. “He has reached the final weeks of the battle,” said Arun Kejriwal, director at KRIS, a Mumbai-based investment advisory firm. Ambani can fight with Ericsson and other creditors but can’t do that with the nation’s top court, he said. Anil Ambani took ownership of the telecom business after battling his older brother, Mukesh, in a high-profile dispute over control of the sprawling conglomerate built by their father, who died in 2002 without a will. Prior to the patriarch’s death, the Ambani brothers served as executives at their father’s company. Three years after their father’s passing, the dispute was settled by splitting the empire into two, vaulting both Ambanis among the ranks of India’s wealthiest businessmen. The founder’s death left the sons in charge of the massive family business just as India was about to enter a growth spurt powered by a newly upwardly mobile middle class. Even as Anil’s star has faded, his older brother Mukesh has gone on to become Asia’s richest man. Representatives for both brothers didn’t comment. Bloomberg News is currently defending litigation brought by Anil Ambani, 59, and Reliance Communications Ltd. in connection with previous Bloomberg reporting. Here’s a look at how the sibling rivalry at the Ambani family, troubles at the telecom business and India’s tougher stance on credit, contributed to the decline in Anil’s fortunes. When the family feud was settled in 2005, Mukesh got control of the flagship oil-refining and petrochemicals business. Anil, meanwhile, got the newer businesses such as power generation, financial services and a telecom business, which was seen as a prime growth prospect. From there, Anil’s companies borrowed heavily to diversify and build a credible conglomerate that could generate the kind of revenue enjoyed by Mukesh’s refining firm Reliance Industries Ltd.
A non-compete clause between the brothers kept Mukesh out of telecoms until the agreement was scrapped in 2010. The elder brother’s return to telecom resulted in the creation of Reliance Jio Infocomm Ltd., which built a nationwide 4G wireless network. At the same time, the younger Ambani brother was facing intensifying competition in the fast-growing wireless-phone business. As carriers fed off each other’s subscribers, Reliance Communications raised borrowings to keep up. Still, the carrier lost its rank as the No. 2 carrier in a slide that accelerated when Mukesh fatefully barged into the market. Jio’s entry into the market in 2016 pressured all rivals, including Anil’s company, because it lured so many of their customers away with free calls and cheap plans. “Telecom was a tale of disaster for Anil owing to cutthroat competition, which led to industry-wide consolidation and debt overhang," said Mumbai-based Alok Shende, principal analyst at consulting firm Ascentius Insights. While his attempts to sell telecom and other assets failed to generate the needed cash, problems emerged at some other businesses as well. Shares of Reliance Naval & Engineering Ltd., a warship and submarine maker bought in 2015, fell as the company continued to post losses. 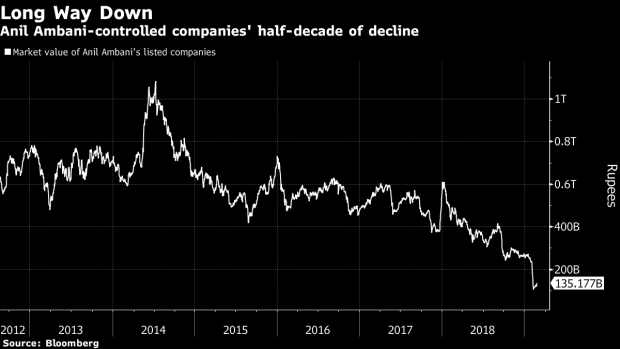 Electricity generator Reliance Power Ltd., also part of Anil’s group, has failed to stem a decade of stock declines since its then-record initial public offering in 2008. The Supreme Court’s remarkable warning to one of the nation’s most prominent businessmen came after months of wrangling. The row with Ericsson began when the Swedish equipment maker sought to collect overdue payments from Reliance Communications, or RCom. The Indian company appeared to settle the dispute with Ericsson in May last year, but failed to meet the payment deadlines, prolonging the row. Separately, RCom had agreed to sell its airwaves, towers, fiber and other telecom assets to Jio in December 2017 to fend off creditors. But regulatory and legal hurdles stalled the closing of the deal, frustrating RCom’s attempts to repay lenders. RCom ultimately decided to enter bankruptcy proceedings this month after struggling to repay billions of dollars in debt. However, India’s top court this week said it will put the Indian mogul behind bars unless his group pays Ericsson within four weeks. As part of efforts to comply with the court order, RCom has said it requested urgent approval from its lenders to release about 2.6 billion rupees ($37 million) received from income tax refunds, which are in its bank account, directly to Ericsson. A sum of 1.2 billion rupees has already been deposited with the Supreme Court and the company is confident it will be able raise the balance of about 2 billion rupees in time, it said. Meanwhile, Anil’s Reliance Capital Ltd. has sought to raise funds by inviting Nippon Life Insurance Co. to take full control of their joint venture Reliance Nippon Life Asset Management, according to a stock exchange statement. "This is the easiest and fastest way to resolve the looming crisis," Kejriwal said.